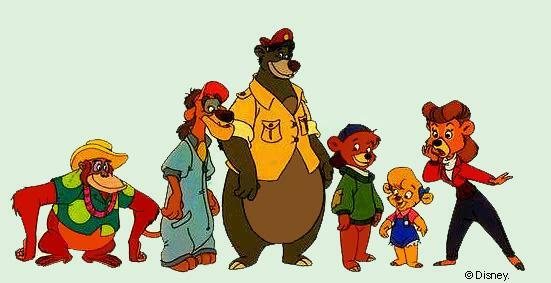 Since I watched The Jungle Book recently, that got me thinking about how weird the concept for TaleSpin was. It’s like, “Hey, remember that bear who sang about picking paw-paws and eating ants? Now he’s a pilot!” I seem to recall reading somewhere that they originally wanted the series to feature Launchpad McQuack, Scrooge McDuck’s accident-prone pilot from DuckTales, but somehow they decided to use Jungle Book characters instead. Well, a few of them, anyway. King Louie was turned into a bartender, and Shere Khan a ruthless businessman. Mowgli didn’t appear, but Baloo’s sidekick Kit Cloudkicker was similar in many ways. He was another bear instead of a man-cub, however, to fit the rule that all of the people were actually anthropomorphic animals. They did this with several of the Disney Afternoon cartoons, really. In fact, there was one Darkwing Duck episode in which Darkwing was transported to the human world, and referred to its inhabitants as “hideous beakless mutants.” Anyway, those were all of the Jungle Book characters who were transplanted into TaleSpin, although one episode did have a talking snake who was reminiscent of Kaa. I can see that making an elephant or a vulture into a person-type character might be difficult, but why not Bagheera? I couldn’t say. This entry was posted in Cartoons, Television and tagged bagheera, baloo, darkwing duck, king louie, kit cloudkicker, mowgli, shere khan, talespin, the jungle book. Bookmark the permalink.